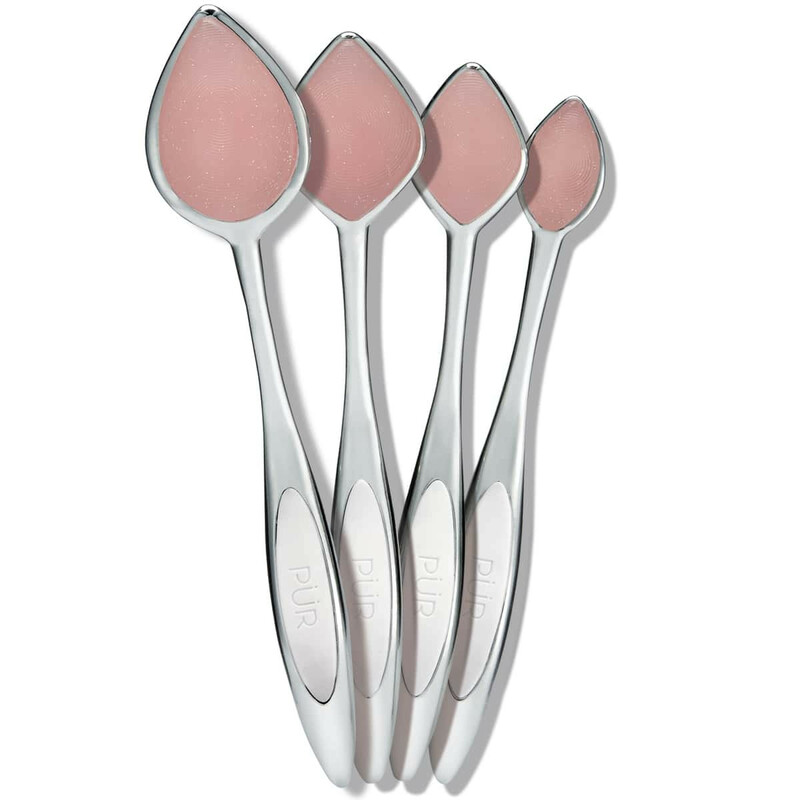 Use less makeup with the innovative and easy-to-clean Pillow Blend Collection Silicone Makeup Application Tools. What it is: A 4-piece silicone applicator toolkit that helps eliminate makeup waste. What it does: Designed to take your application of concealers, contours creams, moisturizers and foundations to the next level, the oil-resistant applicators allow you to smooth on liquid or cream products flawlessly while absorbing less makeup. Use the large applicator to evenly apply foundation, the medium for contour and the small for concealer. These silicone sponge tools are perfect for breakout-prone skin because they don’t harbor bacteria! Cleanup is quick and easy. Unlike having to deep clean your makeup brushes, these applicators can be wiped clean easily between applications with soap and water or makeup wipes. Apply a drop of desired product onto the Pillow Blend Applicator. Use the Pillow Blend Applicator to spread the desired product across your skin. Then use a tapping motion to press the product into the skin. To clean, wash with warm soap and water or makeup wipes. Use with Bare It All Foundation, Cameo Contour & Highlight Stick or Shake & Bake Powder-to-Cream Concealer for an even, flawless finish. When using the Pillow Blend Collection, apply half as much product than you normally would with brushes or beauty sponges! Nice and soft on the skin, blends easily and cleans easily. Awesome product love it . I use it with Powder to set my undereye. I use the larger one for my facial self tanner and I use the smaller ones to contour. High quality with beautiful handles. These are absolutely incredible. I've used them to apply pore punisher. I've used them to apply clay masks. I've used then to apply moisturerisers. They glide with ease and save so much product. I have long nails and lose tons of product alone applying them. I have two sets and will come back for more when I wear them out!!!!! Easy to apply anything with these. I like that they are similar to using my finger, which I tend to use too often. These are smooth and soft. They absorb zero product, so you use less. I wasn't really sure what to expect when I bought these brushes/makeup applicators. I really just bought them on a whim, because they were on sale and I had a coupon code. But wow oh wow am I impressed! They are super soft silicon, with this lightly textured brush head, that looks like a finger print! They blend so nicely and leave a soft border, blending as smoothly as any beauty blender or brush I have ever used. I am just super impressed and I wish I'd bought them sooner! These just came today, and I'm obsessed! I just used the large one to apply my Purple Pore Punisher mask, and it went on so much smoother! I can't wait to use the others for my moisturizers, etc. I really like these a lot, they’re great if you use them correctly. I love that none of my product gets soaked up, but i still need to use a sponge to really blend everything in. I was skeptical, but I’m glad I gave these a chance! I adore these. They work so great at putting on foundation or concealer under my eyes. I feel like I use less foundation with them too. I agree with several reviewers that silicone merely smears the foundation around. Don't waste your time getting frustrated using these for foundation, concealer, moisturizers and such. Serums on the other hand are perfect with these gems. A drop of my Skinceuticals CE Ferulic Acid on the large pillow tapped on one side of my face and one drop for the other is all it takes .Not 3 or 4 drops with half of it running between my fingers that don't need the benefit of the serum. The smallest pillow is used for applying my Advanced Ceramide around my eyes. Two drops from the little capsule per eye takes care of it with plenty left over for the morning. There is no need to use the entire capsule on both eyes in one application- it's overkill and wasteful. For the money I'm saving, these pillows are worth every dime! I love this collection. I don't like silicone sponges but thought I'd try this out as it seems like a unique concept. VERY soft, does indeed imitate use of fingers. It took me 4-5 tries before I figured out that (a) I was using too much product, and (b) I kept alternately trying to use these like a sponge (all patting) and a brush (all strokes.) It should be a hybrid. I put a very tiny dot of product (primer/foundation/concealer/etc.) in the middle of the wand of my choice; I use wiping/stroking motions to spread it, then use gentle pats to smooth it in. And I use a little hand soap and water for about 2 seconds when I'm finished, BAM, completely clean and ready for the next use! Once I figured out how to use these, I fell fully in love with them. I tried my sponges and brushes again and just went back to these because the Pillow blends use SO much less product and give me such an airbrushed look. I have a hard time getting product applied. I pat but product is still very visible. I had higher hopes for these. I really wanted them because of the easy cleaning feature. Unfortunately, they don’t blend well. The pillow is soft but too soft for foundation. Just bought these and omg, everyone should buy these. I used them to apply my 4 in 1 foundation cream. And the application went on flawless. I cannot wait to try it tonight when i do my nightly skin routine. I have never seen my foundation go on so smoothly and it was so easy to blend with these. They work really well on the face and blend out foundation and concealer nicely! They are all lightweight and easy to wash . WARNING! THIS ITEM FALLS APART EASILY AND THE COMPANY DOES NOT CARE!! I received this item as a gift. I used it one time and the pillow portion came unglued from the handle. I contacted the company and they told me my only option was to return to the store it was purchased at which is 4 hours from my home to have it exchanged. I would warn any potential customers that they don't stand by their products. Finally. Everyone must have these...This new technology concept brush is all we needed to add to my brush collection. I am completely in love with the way these tools set product and evenly blend into the skin with a finger like application. From skin care, to my primer, to my concealer and even my foundation I get the best smooth coverage and my skin looks absolutely skin flawless. Thank you!!! This pillow blend collection of silicone blenders is life changing! These put my make up and skincare so smoothly into the skin creating a flawless finish as if I were airbrushed! perfect for lymphatic drainage and product application!!! also great for the glitters! Best brush collection I own! I was shocked at how well these performed!! I was questionable at first, but as soon as I put them to use....MIND BLOWN!! Foundation is airbrushed, concealer airbrushed, primer applied without fingers, moisturizer applied without fingers, eye cream patted in without my finger, AND absolutely NO product was left behind on the brush! You will use 100% of your products without depositing oils from your hands! Officially OBSESSED!!! Love using for my serums and moisturizers, no product wasted! I feel like my skin is getting the full benefits from my ceretin serum and get a lift! The smaller applicators also work great for my under eye concealer! I use the big one to apply my charcoal and mud masks, no more hardening clay or black charcoal stuck under my nails! I use the tiny one for my eye cream. I can't wait to see how my airbrush foundation works with the 2nd one!! These are so unique! The fingerprint design on them makes applying product a breeze since there is enough texture on the silicone to actually spread and blend. Loved it for foundation and skincare. I love this for skin care and all of my favorite foundations concealers and primers.. can't say enough about this set amazing never waste any product again!!!! Ok so let me just say these have become a staple in my skincare routine. I love massaging my moisturizer and serum with these. They also lay masks on so evenly. My secret is I always keep the small one running under cold water to just press and cool my face down before bed. Got these and was a little nervous about how to use them and what my make up will look like... needles to say i freaking love these. I use mush less make up now and still get full coverage. Beautiful collection and easy to use for any liquid foundation or skincare. These brushes actually allow you to use less product and achieve a more full coverage look. The small edges are great for hard to reach areas like under the eyes and around the nose. These even work great applying your moisturizer, mask and serum. i am a brush lover, so having new tools like pillow blend for my skincare, primers etc. is a dream come true! I use the pillow blend on everything from my skincare to primers and anything that I need a little extra blending. These brushes are really neat. I was skeptical about the silicone brush idea but after some research I found this is really good for my acne prone skin so not to hold or spread bacteria. I like to use the different sizes for foundation, concealer and also all my skincare! Definitely recommend! I would definitely recommend this collection. They blend really good and are easy to use. I love that my makeup is not being wasted like when using a blender. My makeup last longer because of this.